We want to remind you that even though it’s cold out, your help is still needed! Winter tends be a little slower and quieter for everyone so plan a clean-up to keep yourself busy this season. Bundle up in a warm jacket and your favorite gloves, grab some friends, and keep cleaning! Thanks again for all the volunteers’ hard word work this year! Please share with anyone that you think is a good fit for this grant! “On a cold but sunny day in November, 81 sixth graders plus faculty and staff amassed on the front lawn of University Prep School. 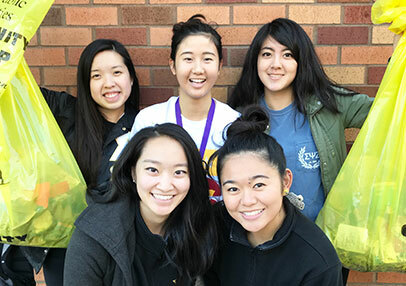 Their mission: clean up Dahl playfield and the local neighborhood. Eight teams went out and conquered! With the support of the Adopt a Street program they all had bright orange vests, gloves, litter pickers and bags. It was great fun to watch these teams head into the playfield and the neighboring streets around the school. They were only out for an hour, but they brought back a lot of litter! I overheard one of the faculty that had been in Dahl playfield share that the field was so clean now one could eat off the ground! Thanks Gwen, we love hearing stories about youth involvement! In October, we welcomed Darby Jenny as our new intern Volunteer Coordinator. 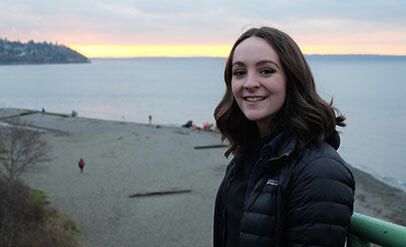 Darby is an undergraduate at the University of Washington pursuing a double degree in Environmental Science and Resource Management, and Mathematics. She is happy to be your new point of contact for the Adopt-a-Street program and is looking forward to getting to know all the volunteers. Haven’t been actively volunteering for a while? Do you want to start your own volunteer group or take on a neighborhood cleaning project individually?